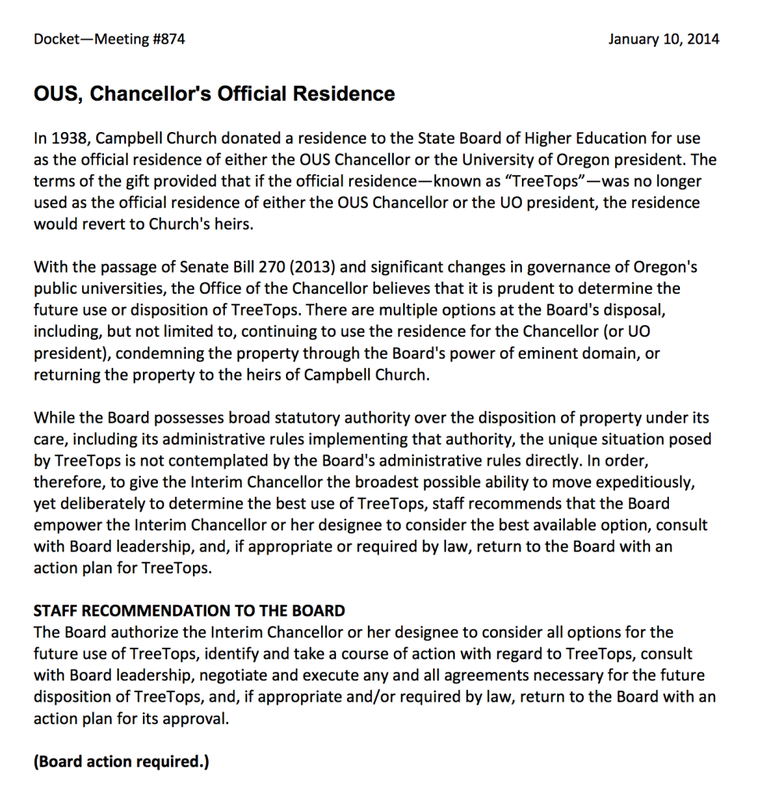 It looks like the OUS Board is finally going to decide what to do with Tree Tops. By condemn they mean seize it under eminent domain, and presumably pay the heirs the market value, which according to Zillow is $1.4M. The full docket for the board’s 1/10/2013 meeting, which includes one of Matt Donegan’s special executive sessions as well as approval for work on utility tunnels and Chapman Hall as well as cuts to the state lottery subsidy for Duck sports scholarships, is here. Greg Bolt of the RG has a great story about OUS Chancellor George Pernsteiner’s non-use of his state provided mansion in Eugene, Treetops, at 2237 Spring Blvd. The state pays $50,000 plus in maintenance, plus another $20,000 for travel, plus $280,900 in straight salary. (See this Oregonian report on how Pernsteiner got raises while others got furloughs). Oh yes, we also give him $23,120 for “professional development” expenses. OUS does not have any documentation on how he actually spends that. Unbelievable. Here is some documentation on how he charges the state for per diem while living at his 2nd house in Portland – for which the state gives him another $26,000 a year, so he can make the mortgage payments. He is using tuition money to pay for his morning croissant and latte. The Treetops utility bill is $1,000 a month. Pernsteiner was letting his kids’ college student friends live there. Maid service is ~$8,000 a year, paid by the state. Party on. “Whether we’re imposing an obligation on him that’s worthwhile, from the board’s point of view or not, that’s something we perhaps ought to take a look at,” Kelly said. Yes, that sort of money can be a tough obligation to impose on someone, I hear. I’m glad the board doesn’t spend it on professors. Or students, god forbid. In unrelated news, yesterday Governor Kitzhaber announced his intention to disband the State Higher Education Board. It’ll be tough for Pernsteiner to get another gig like this, without a PhD. Tagged OUS Board and Chancellor, Pernsteiner, Treetops. Bookmark the permalink. Give it back to the heirs. Save the state the maintenance money, and get it back on the Eugene tax rolls. The UO President is also allowed to have it under the bequest. OUS has been a great steward of the property over the past 50+ years and there is currently little or no deferred maintenance. I daresay that had the heirs had the property they would have sold it long ago for 1/4 the current value. That value which was paid for and maintained by the citizens of Oregon. The next UO president can immediately move in while MG gets his year sinecure… Or perhaps bean can move into Moron House for a few years.